The symbolism and practices surrounding menstruation differ across cultures: in some it is largely concealed and in other more conservative societies, it becomes visible and more stigmatised. But the common feature is that menstruation is a taboo. In some extreme cases, like in parts of the mountains of western Nepal, women are banished to the cowshed for four days in a month. In the past months alone, two young women have lost their lives, once more sparking national outrage over the practice, known as chaupadi. In December 2016, 15-year-old Roshani Tiruwa in Achham district was found dead in a tiny menstrual hut. A month earlier, Dambara Upadhyay, 26, also died while living in the outhouse during her period. 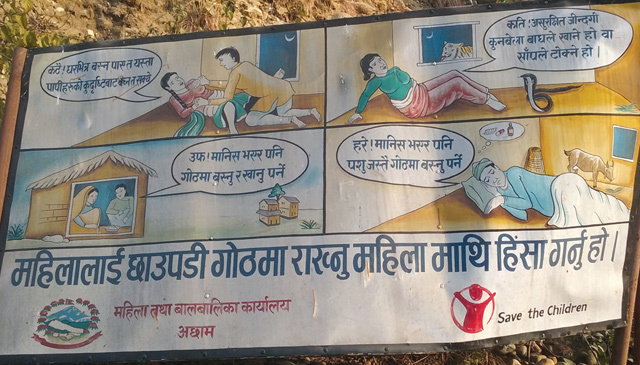 Snake bites, wild animal attacks, suffocation from smoke, and sexual harassment and assault are threats that many menstruating women and girls face during this monthly exile. In 2005, the Supreme Court outlawed chaupadi and in 2008 the Ministry of Women, Child and Social Welfare promulgated guidelines to eradicate it. However, a 2011 UN report of Achham district estimated that about 95 per cent of women still practiced chaupadi. This staggeringly high figure alone shows that changing age-old traditions and social attitudes requires more than legal reforms and guidelines. The impact of stigma compounded with poor menstrual hygiene hinders equal and meaningful participation of women and girls in education, economic activities, and perpetuates the cycle of gender inequality and social exclusion. Menstruation affects school attainment with a third of girls missing schools during periods in Nepal. Poor menstrual hygiene also results in reproductive health ailments such as urinary tract infection, and other problems arise from internalised feelings of shame and untouchability. Creating a safe and enabling environment for women and girls to manage their menstruation hygienically, and with dignity is therefore an important development and human rights agenda. Breaking the taboo on talking about periods is the first step, with interventions required in both schools and communities. According to WaterAid’s 2009 study in Nepal, only 17.2 per cent said that they were informed about menstruation by teachers, majority of whom avoided reproductive health topics, prescribing self-study instead. Another study shows that participants learnt about menstruation towards the end of secondary school, but many had already started their periods by then. It is important to educate both girls and boys on how period happens through age appropriate and culturally sensitive teaching materials. It is not enough for menstruation to be featured in school curriculum, attention must also be paid to how, when and whether the curriculum is being taught at all. Engaging young people is important as they can be agents for change, but the stronghold of culture, and internalisation of shame and inferiority cannot be underestimated. Although a majority of women believe menstruation as a normal biological process, they also observed menstrual restrictions often accepted on the grounds of long-standing tradition and family pressure, particularly from mother-in-laws and grandmothers. These findings suggest that any interventions should go beyond the individual level and focus on local and collective efforts to challenge adverse social norms. This was evident in villages such as Bhageshwar in Achham and Gairagaun in Bajhang that have eliminated chaupadi. In both cases educated women themselves took the lead by coming together as a group to collectively campaign against the practice. In other places like Mangalsen, remittance from workers abroad has resulted in better houses with more rooms so that menstruating women and girls no longer have to go out, creating a domino effect in the wider community. However, such incremental changes must be complemented by collective action if the aim is to focus not just on practical but also ‘strategic needs’ related to challenging women’s subordinate position in society. It is estimated that only 36 per cent of schools in Nepal have a separate toilet for girls. Access to affordable menstrual products along with provision of separate toilets with door locks, running water, soap and waste disposal facilities should be taken into account in Wash, Sanitation and Hygiene (WASH) interventions. Most importantly, menstrual taboo and stigma should be seen as manifestations of unequal gender relations. Future action should focus on individual empowerment as well as changing the wider social discourse. Sangita Thebe Limbu is a Gender Analyst at Social Development Direct. Nepali cartoonists had a field day during the election campaign and after, lampooning everything from the unexpected win of the Maoists, the bad losers in the other parties and looked forward to the challenges of the parties.